A model of a molecule of n-butyllithium, an organometallic compound. Organometallic chemistry is the study of chemical compounds containing bonds between carbon and metal atoms. In more general terms, it is the study of compounds containing metal-element bonds that are largely covalent in character. Organometallic chemistry combines aspects of inorganic chemistry and organic chemistry. Living systems contain a variety of organometallic compounds, prominent examples being hemoglobin and chlorophyll. The specialized field focused on the study of such compounds is known as bioinorganic chemistry. Organometallic compounds have a variety of practical uses. For example, ferrocene and MMT (methylcyclopentadienyl manganese tricarbonyl) are added to gasoline as antiknock agents. The industrial manufacture of acetic acid from methanol and carbon monoxide (by the Monsanto process) involves the use of a rhodium-carbonyl complex. A titanium-based organometallic compound, called the Ziegler-Natta catalyst, is used in the production of polyethylene and other polymers. 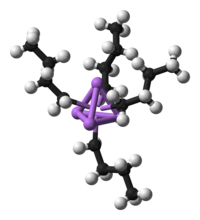 Also, the ruthenium-BINAP complex is used in the production of fine chemicals and pharmaceuticals. A number of researchers have been awarded the Nobel Prize in Chemistry for their work in the area of organometallic chemistry. For example, the 1973 Nobel Prize was awarded to Ernst Fischer and Geoffrey Wilkinson for their work on metallocenes. In 2005, Yves Chauvin, Robert H. Grubbs, and Richard R. Schrock shared the Nobel Prize for their work on metal-catalyzed olefin metathesis. Organometallic compounds are often distinguished by the prefix "organo-," as in organopalladium compounds. They are also known as organo-inorganics, metallo-organics, and metalorganics. Examples of such organometallic compounds include all Gilman reagents that contain lithium and copper, and Grignard reagents that contain magnesium. Tetracarbonyl nickel and ferrocene are examples of organometallic compounds containing transition metals. In addition to the traditional metals and semimetals, elements such as boron, silicon, arsenic, and selenium are included to form organometallic compounds. Examples include organomagnesium compounds such as iodo(methyl)magnesium MeMgI, diethylmagnesium (Et2Mg); organolithium compounds such as butyllithium (BuLi), organozinc compounds such as chloro(ethoxycarbonylmethyl)zinc (ClZnCH2C(=O)OEt); organocopper compounds such as lithium dimethylcuprate (Li+[CuMe2]–); and organoborane compounds such as triethylborane (Et3B). Biological systems contain a variety of organometallic compounds. Examples include hemoglobin and myoglobin, each of which contains an iron center bonded to a porphyrin ring; and chlorophyll, with magnesium at the center of a chlorin ring. Early developments in organometallic chemistry include Louis Claude Cadet's synthesis of methyl arsenic compounds related to cacodyl, William Christopher Zeise's platinum-ethylene complex, Edward Frankland’s discovery of dimethyl zinc, Ludwig Mond's discovery of tetracarbonyl nickel (Ni(CO)4), and Victor Grignard’s organomagnesium compounds. The abundant and diverse products, from coal and petroleum, led to Ziegler-Natta, Fischer-Tropsch, hydroformylation catalysis, which employ carbon monoxide (CO), hydrogen (H2), and alkenes as feedstocks and ligands. In the absence of direct structural evidence for a carbon–metal bond, some compounds are not considered to be organometallic. Thus, the status of compounds in which the canonical anion has a delocalized structure in which the negative charge is shared with an atom more electronegative than carbon (as in enolates) may vary with the nature of the anionic moiety, the metal ion, and possibly the medium. Depending mostly on the nature of the metallic ion and somewhat on the nature of the organic compound, the character of the bond may either be ionic or covalent. Organic compounds bonded to sodium or potassium are primarily ionic. Those bonded to lead, tin, or mercury, are considered as having covalent bonds, and those bonded to magnesium or lithium have bonds with intermediate properties. Organometallic compounds with bonds that have characters in between ionic and covalent are very important in industry, as they are both relatively stable in solution and relatively ionic to undergo reactions. Two important classes are organolithium compounds and Grignard reagents. In certain organometallic compounds, such as ferrocene or dibenzenechromium, the pi orbitals of the organic moiety are believed to be involved in binding to the metal. Electron counting is a key to understanding organometallic chemistry. The 18-electron rule is helpful in predicting the stabilities of organometallic compounds. Organometallic compounds that have 18 electrons (filled s, p, and penultimate d orbitals) are relatively stable. This suggests the compound is isolobal, but it can result in the compound being inert. To understand chemical bonding and reactivity in organometallic compounds the isolobal principle should be used. NMR and infrared spectroscopy are common techniques used to determine structure and bonding in this field. Organometallic compounds find practical use in stoichiometric and catalytically active compounds. Tetraethyl lead previously was combined with gasoline as an antiknock agent. Due to the toxicity of lead, it is no longer used, and it has been replaced by other organometallic compounds such as ferrocene and methylcyclopentadienyl manganese tricarbonyl (MMT). The Monsanto process utilizes a rhodium-carbonyl complex to manufacture acetic acid from methanol and carbon monoxide industrially. The Ziegler-Natta catalyst is a titanium-based organometallic compound used in the production of polyethylene and other polymers. In the production of fine chemicals and pharmaceuticals, Ryoji Noyori's chiral ruthenium-BINAP complex catalytically reduces beta-ketoesters to secondary alcohols. A wide variety of elements of the periodic table can form organometallic compounds. Examples are given below. This page was last modified on 3 January 2019, at 22:13.